You may have seen pictures of two people engaged in yoga postures together where they’re balancing in a posture that seems nearly to defy gravity. Sure, that’s one type of partner yoga, but there are plenty of basic postures you can practice with your significant other that can help not only your practice, but your love life too. 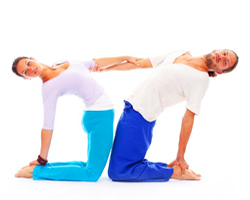 Here are five simple but beneficial yoga poses to do with your partner. A perfect partnership is one where you can lean on each other—and double tree can help you do that. And while you’re supporting each other, you can also strengthen your legs and open your hips. Stand side by side facing the same direction with your inside arm around each other’s waist. With your weight on the inside leg, bring your outside foot to your ankle, calf, or thigh as you would for a regular tree pose. Once you have your balance, bring your arm across the front of your body and press your palm against your partner’s. Hold this pose for five to 10 breaths, then switch sides. Performing a forward fold with your partner can help you get an amazing stretch in your hamstrings, and it’s a bit on the intimate side too! Stand back to back and allow about six inches between your heels and your partner’s. With your hands on your waist, hinge at the hips and fold forward. You’ll know you’re a good distance from your mate if your back ends touch when you both fold over. While in the fold, reach back and grab hold of your partner’s arms or shoulders and pull yourselves closer to each other. Hold this for five breaths or longer. When you’re ready to let go, place your hands on the floor, then slowly roll up. Part of what makes relationships so hard is that they involve matters of the heart. So what better way to get closer to your partner than doing a heart opener together? Kneel facing each other about one or two inches apart and grasp on to each other’s forearms. With your knees and the tops of your feet firmly planted on the ground about six to eight inches apart, gently push your hips forward, open your chests, drop your heads back, and lean back. As your move into the pose, your arms will naturally straighten to support each other. To mix it up, you can each let go your partner’s forearm on one side and reach back behind you to grasp your ankle with your free hand. If you’re doing the variation, repeat on the other side for an even backbend. Breathe deeply for three to five breaths, then pull against each other to straighten up. Relationships are about give and take. Here’s a partner pose that lends itself to just that. Sit on the floor back to back with your legs extended straight. 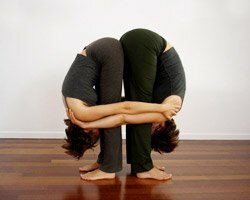 As one partner arches his or her back, the other partner folds forward. The partner in the backbend can get deeper into the heart opener while helping their significant other fold deeper into the pose. Hold for three to five breaths, then switch. Relationships are better when you’re moving in the same direction, but that doesn’t mean you can’t get a little twisty together. Sit back to back with your legs crossed in front of you. Place your right hand on your partner’s left thigh behind you, and your left hand on your own right knee. Have your partner do the same. On each inhale, lengthen your spine; as you exhale use your partner’s body to get deeper into the pose. Communication is key in any relationship, and that’s definitely true when doing yoga with your partner. It’s important you communicate and don’t let one partner push the other past their edge. Listen to your body, listen to your partner, and together with partner yoga, you can take your relationship deeper in a way that only yoga can make possible.